Sometimes the easiest way to understand a system is by looking at it backwards. 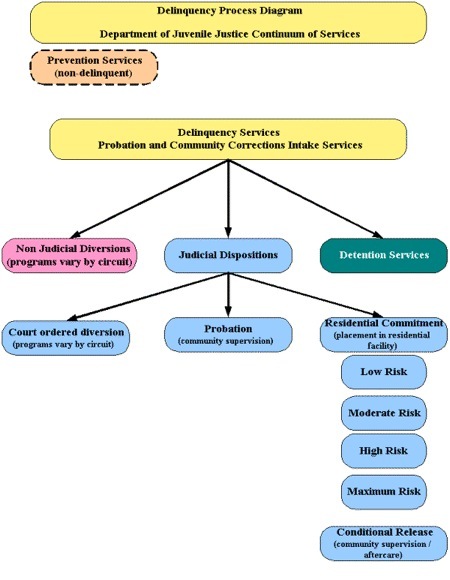 Below is a chart developed by the Florida Department of Juvenile Justice to help better understand the Juvenile Justice system in Florida. The Law Offices of Whittel & Melton has offices in Tampa, Tarpon Springs, New Port Richey, Spring Hill, Bushnell, Inverness, Ocala and Gainesville. Criminal Defense Attorneys are ready to defend your child throughout the following Florida communities: Alachua County, Citrus County, Hernando County, Hillsborough County, Lake County, Levy County, Marion County, Pasco County, Pinellas County, Polk County, Sumter County, Brooksville, Crystal River, The Villages, Bronson, St. Petersburg, Clearwater, Lakeland, Bartow, Dade City, Hudson, Trinity and Holiday. If your child, your nephew/niece, grandchild or a friend's child has been charged with a Juvenile crime in Florida, call Juvenile Criminal Lawyer Jason M. Melton today 866-508-5529.